This smaller release features three improvements for postings and the possibility to disable notification popups. It is now possible to move message board postings from one message board to another (sub)board of the same message board branch. That means you can move it to the root message board and all subboards of it. The posting's message board is shown. It can be changed to its new board. Afterwards the user will be redirected to the set message board. 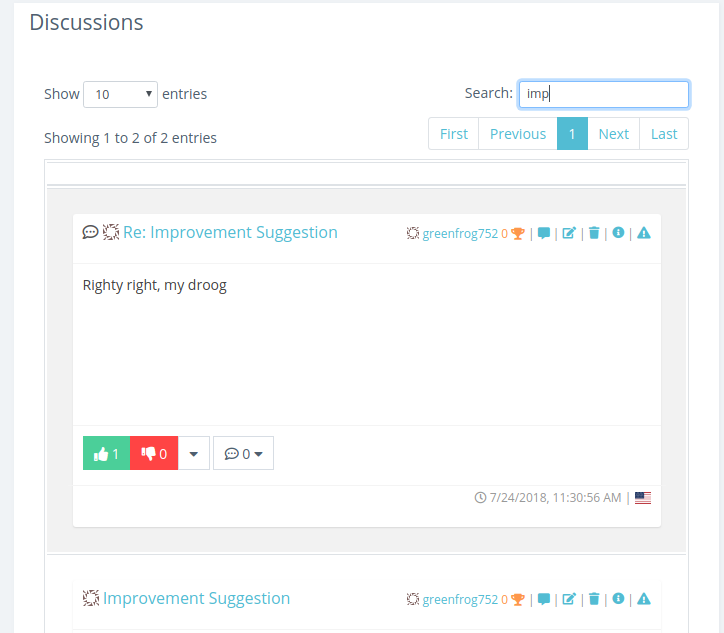 It's now possible to moderate message board and news posts. Everyone can (try to) edit or delete postings but only if you have the permission to do so you can actually perform that task. This allows message board moderators to edit, move or delete other author's postings and alliance press officers to edit the news postings of another press officer. The discussions table of a message board now offers a search field. This allow you to search for all postings of the message board and its subboards including comments. If you have a lot of open orders it can happen that get notified about successful trades and such every few seconds. To prevent you getting notification spammed or if you are on a mobile device it is now possible to turn the notification popups off. Turning them off does not affect the notification count, you just do not see those blue detailed notification popups. If you are interested in what is going on you can still click on the bell and check out the detailed notifications in the table of the notifications page.